The Season of Lent is just around the corner. Ash Wednesday the beginning of the season is March 6. This week a letter outlining our plans for Lent will be mailed to parish households. Watch for it in your mail. The Lenten Season is a great time for evangelization and it doesn’t have to be knocking on doors or preaching on street corners. Although that isn’t always a bad thing. A recent article on the U.S. Bishop’s website outlined six ways we can quietly evangelize this Lent. On Ash Wednesday when people tell you that you have a dirty forehead. Explain to them that it comes from the ashes you got at Mass earlier in the day. Tell the observer that the ashes aren’t something dreamed up by the Catholic Church but a sign of penance going back to the Old Testament. Tell them the ashes are also a sign that God created us from the dust of the earth and we will return to dust. Tell them it is a sign that God has destined us for immortality and that while our bodies will return to dust God has saved our souls for everlasting life. When you are asked what is going on when you are eating a toasted cheese sandwich rather than your favorite burger. Explain it is because you are abstaining from meat on Fridays. Tell your questioner that Catholics make a sacrifice by abstaining from meat on the Fridays of Lent as an external sign of inward conversion. Inform them that not eating meat is an outward sign of your desire for inner purification and a desire to respond to God’s will for you. If someone asks you to explain why you say you have given up an item of food or a favorite diversion for Lent tell them it is part of your seasonal practice of penance and sacrifice. Tell them that the reason for giving up something during Lent is to help you strengthen your love of Christ and your resilience against temptation. Should someone ask why you bother giving that item up for just a few weeks when you are going to go right back to it on Easter. Tell them that external sacrifice is a manifestation of inner conversion. Explain to them that self-denial for even a short time has a lasting effect on a person. When we do anything however small to glorify God we grow in His love. Every gesture of love leaves a lasting impact. On Palm Sunday if someone asks why you are walking around with a branch. Tell then that it is part of an ancient custom that goes back to before the life of Jesus. Describe to them that it was the practice of people in Jesus’ day to welcome an important ruler to a city or town by covering the road with branches as a sign of respect. Explain to them that when Jesus came to Jerusalem at the beginning of Holy Week, he was welcomed with this ritual of respect given to a King. Say to them that within the week the same crowd would crucify him. They would kill him using the most brutal form execution imaginable. You can re-count to your questioner that you take the branch and place it in a prominent place in your home. Throughout the year it will remind you of the great humility of our Lord who chose the suffering of the Cross to win for us all salvation from sin. If your employer asks why you have request Good Friday as a vacation or personal day off tell them that you plan to use the day as a day of quiet reflection. You want to spend some time that day in contemplation on how Christ has died for us to win the gift of everlasting life. Say to them that you plan to attend the Good Friday Service at 3 PM, the hour of Jesus death, as a sign of your thanksgiving and devotion to Jesus. Enform them of your plan to use the day to symbolically walk with Jesus Christ to Calvary and to immerse yourself in his love and mercy. Lent is a good time to evangelize. It is a time when we use so many outward signs and symbols to explain our faith in God and appreciation of Jesus’ death on the cross. Take every opportunity you might have during the season to answer questions about our Catholic Christianity and its use of signs and symbols to explain our faith. They are such good tool for evangelization. Also plan to invite a friend or family member who might have strayed from coming to church back to Mass. Over the past few years the Catholic Church has suffered from a decline in membership because of the sexual abuse scandal and other controversies. During the Lenten Season Fr. Sullivan will be preaching a series of homilies called “Rebuilt”. He will be discussing various steps we can take as individuals and as a parish to rebuild and rededicate our parish to its role of developing all our members into disciples. It will be a good time for those who has fallen away from their faith to have it renewed and rebuilt. Before Masses this weekend, Ginny Vatelli, will speak for a few minutes to invite married couples to consider participating in a weekend retreat called Marriage Encounter. Marriage Encounter is designed to help good marriages become better. Couples don’t need to be newly wed or young to benefit from the weekend. Couples of all ages are encouraged to take advantage of the opportunity. Pope Francis will be meeting with Presidents of Bishops Conferences, Superiors of Religious Congregations and other Church leaders on the sexual abuse crisis. Reports are that the meeting will be aimed at presenting a unified response to the crisis by developing Church wide standards of responsibility, accountability and transparency regarding the issue. Please pray for participants to be open to the Holy Spirit’s guidance as the meet February 21-24, 2019. Reserve Saturday, March 9, 2019, so you can attend the 2019 Fall River Women and Men’s Conference to be held at Stonehill College, N. Easton. The theme of this year’s conference is Living in the Light of Hope. Conference presenters will include Bishop Robert Reed from the CatholicTV Network, Scripture scholar and author Dr. Mary Healy from Detroit’s Sacred Heart Seminary and Deacon Pedro Guevara-Mann, author and host from Salt+Light Media of Canada. The day will conclude with Mass celebrated by Bishop Edgar da Cunha. 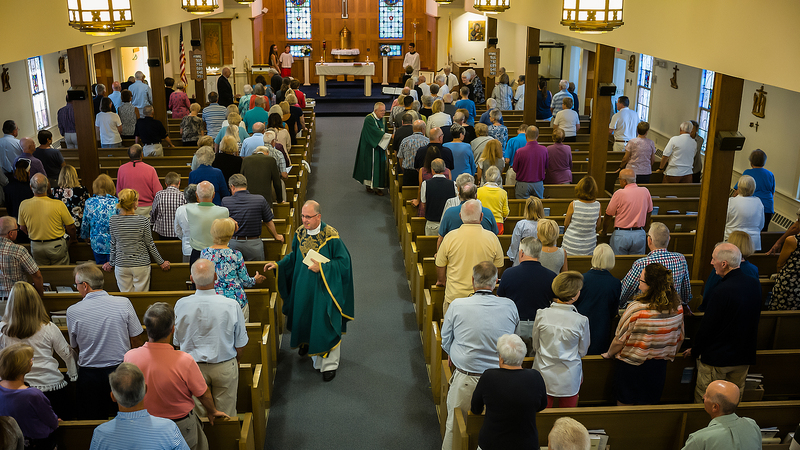 A dozen parishioners attended last year’s conference. Some of them got their picture taken with Bishop da Cunha and ended up on the cover of his pastoral letter. The parish is planning to hire transportation again this year so you need not worry about driving. Registration forms are available on the table at the back of the church.